The teams involved will have by now defined the specific categories under the specific titles of Cost and Delivery that are going to be charted in their Green Rooms. The Quality charts are standard, viz. External and Internal Customer Concerns, Defects Produced and Defects Received. The Safety charts will follow the countries requirements with the addition of a chart called Near Misses or Near Hits. The Idea Suggestion Chart – Morale – will have a specific template for recording the ideas in the Green Room. Secondly, they will have established the basic format of the charts based on templates we give them. Thirdly, they have put a data collection process in place that will ensure that the data can be easily obtained by the leaders each day or each week. Additionally, the physical Green Area Meeting Room should be fully prepared. The team leaders will be fully trained in the proper techniques and methods in conducting Green Room Meetings so that the meetings are productive and follow a set format. This will ensure that the team is able to search for solutions to problems that become evident based upon the charts being reviewed. Without a thorough knowledge of and adherence to these techniques, the meetings will fall far short of the expected goals. To that end, the training also includes the participation of the levels of management above the First Level Green Room Meeting so that they are aware of these methods and can coach the leaders as needed. 3. To establish the framework for the 2nd Level and set up the 3rd, 4th and 5th levels if they apply. 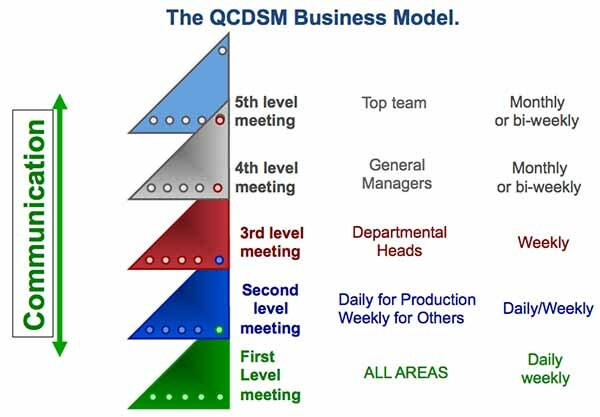 One of the key factors that defines the QCDSM System and the success achieved, is that this is THE way of doing business for the entire facility. To support the First Level Green Room Meetings, daily and weekly meetings are structured within the facility to ensure that the concerns and issues facing the teams are being addressed and communicated up the chain of command – the important Supply Chain. The entire facility begins to operate as a support system and management receives information regarding these issues. By being constantly aware of the issues facing the teams, management can take the necessary steps to assist and support them.